« MADINA LAKE “THEY’RE COMING FOR ME” – NEW SINGLE RELEASED AND IT’S IMPRESSIVE!! BLACKMORE’S NIGHT “SECRET VOYAGE” – I’M ON BOARD FOR THIS MUSICAL JOURNEY! BLACKMORE’S NIGHT – Ritchie Blackmore has never abandoned his love affair for creating incredible classical sounds with his guitar. The lure and attraction for Renaissance music has made Ritchie Blackmore and Candice Night become an impeccable duo of musical minds and talent since their 1997 Blackmore’s Night album debut – Shadow Of The Moon. With 1970’s era Rainbow, Ritchie Blackmore intertwined the Renaissance sound with bluesy Rock and Hard Rock like no other. It only makes sense to me, that Ritchie has taken his immeasurable musical talents to this extraordinary level of existence with Blackmore’s Night, so many years ago. No one will find the supercharged Hard Rock sound of Straight Between The Eyes or Bent Out Of Shape with Blackmore’s Night. This is another world of music prowess for Ritchie Blackmore and I’m admittedly hooked on this Secret Voyage… it’s an impossible thought for me not to embrace this music. If it’s not the guitar virtuosity of Ritchie, then it’s the beautiful and mesmerizing voice of Candice Night that thrills my ears and mind into a state of… joy. Rainbow Eyes is such a wonderful song to hear and Candice Night’s vocals just might have me growing wings and flying through the sky… in my Secret Voyage dreams that is. Taking a Rainbow classic, such as Rainbow Eyes from the 1978 album Long Live Rock ‘n’ Roll and covering it this way is certainly a musically credible move by Ritchie Blackmore, in my Metal opinion. The liner notes to Secret Voyage characterize the music created by Blackmore’s Night as Renaissance/Folk/Rock and I won’t disagree. What should be conveyed here to all, is this style of music should not be judged until it is heard. Anytime the words “Folk” or “Renaissance” come into view of a Rock/Hard Rock or Heavy Metal platform such as Metal Odyssey, it can become quite deceptive. Music genres unfortunately can fall victim to stereotyping, sad but true. In listening to Blackmore’s Night, I have become all the more rich in my quest for hearing all the great works of Ritchie Blackmore. The elements and styles of music heard from Blackmore’s Night are not worlds apart compared to that of early Rainbow and many of the works of Yngwie J. Malmsteen. I can even go further by adding in The Electric Light Orchestra or The Moody Blues as well, when it comes to stylistic comparisons. Can’t Help Falling In Love is easily guilty of being the “heaviest” song on Secret Voyage, with both it’s tempo and overall energy of sound. Trust me, this is not the molasses sweet and teary eyed original version of Can’t Help Falling In Love made famous and sung by the unreal legendary Elvis Presley in the 1961 film – Blue Hawaii. Forget the UB40 cover version of this song as well… for Candice Night and Ritchie Blackmore make Can’t Help Falling In Love an upbeat, Rockin’ and inspirational listen, like it has never been done before. The Renaissance fair kicks into high gear with the song – Peasant’s Promise. Once again, the music shares center stage with Candice Night’s vocals. As I listen to this song, I surely wish I owned and could play a shawm, so I could bounce around my surroundings while I gleefully take part in this Renaissance Folk euphoria that I’m experiencing. I’m not kidding or being a wise-guy here. The more I listen to Secret Voyage, the more I wonder as to why this album did not win one of those coveted Grammy’s? Politics I reason. Far Far Away has a tinge of Enya “style” background chorus/vocals, which only enhances the sensory backdrop of this earthy fortified song. Very mellow, very soft are the vocals of Candice Night on Empty Words… coupled with the acoustic magic that resonates from Ritchie’s guitar are enough to make my Metal heart melt, like a slab of butter on an open fire. Hey Celine Dion… I have two words for you… Candice Night. Metal be thy name. Guitar enthusiasts, Rainbow and Ritchie Blackmore fans should already be in the know with Blackmore’s Night. Fans of Folk, Renaissance Folk/Rock may very well become enriched with the sounds of Secret Voyage. Any Old School Metalhead like myself, that has a spot in their Metal heart for the guitar greats of our generation, might just take a dive into Blackmore’s Night and fall victim to this living legend’s guitar once again. Ritchie Blackmore and Candice Night come across to my ears as two musicians who were born to be together, not only as husband and wife, as Blackmore’s Night as well. * Blackmore’s Night – Secret Voyage was released on July 15, 2008, on Steamhammer/SPV. 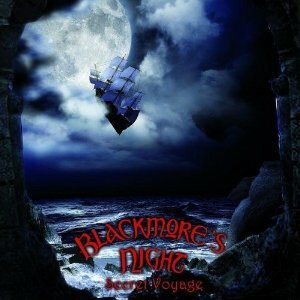 Secret Voyage is the seventh studio album from Blackmore’s Night. * A special thanks to Metal Mark at Heavy Metal Time Machine for pushing this album my way. This entry was posted on September 4, 2010 at 10:01 am and is filed under classic rock, classic rock music, folk rock music, metal odyssey, Music, renaissance music, rock and roll, rock guitarists, rock music, rock music news with tags 1970's rock guitarists, 1980's rock guitarists, 1990's rock guitarists, blackmore's night, candice night, classic rock music, folk music, folk rock, guitar legends, metal odyssey, Music, renaissance music, ritchie blackmore, rock guitarists, rock music, secret voyage album review. You can follow any responses to this entry through the RSS 2.0 feed. You can leave a response, or trackback from your own site.